Bobcats have a tendency to cause problems for homeowners who have domestic pets living outside their home. most bobcats won’t attack humans, they will attack small animals. Bobcats can cause most trouble in rural areas with attacks on poultry, ducks or small pets kept outdoors. We offer live bobcat trapping and relocation services. Bobcats are opportunistic predators, feeding on poultry, sheep, goats, house cats, small dogs, exotic birds and game animals, and, rarely, calves. Bobcats can easily kill domestic and wild turkeys, usually by climbing into their night roosts. In some areas, bobcats can prevent the successful introduction and establishment of wild turkeys or can deplete existing populations. 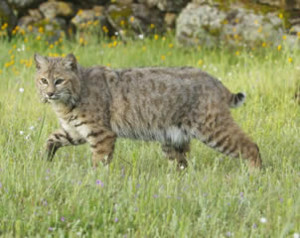 It’s inevitable that with housing expanding continuously into wildlife habitats that there will be problems with bobcats in some yards or homes. We come in and carefully remove the bobcat from your location to prevent any unsafe conditions, re-introduction of the species, or the spread of diseases. For more infromation on bobcats Please Click Here As with their main competitor and sometimes nemesis, the coyote, they are quite capable of living adjacent to human habitation. When bobcat damage occurs it is best to contact a professional like Trapper J to help get rid of your bobcat problem. We offer bobcat removal and bobcat control services to prevent future bobcat issues.